Cover image: Marty's Original World Famous Burger. Amanda Meth for Bushwick Daily. 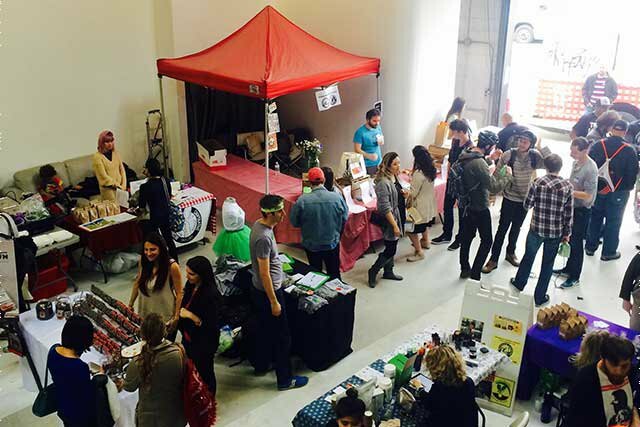 This past Saturday, Bushwick enjoyed its first annual vegan food and lifestyle festival at LightSpace Studios. 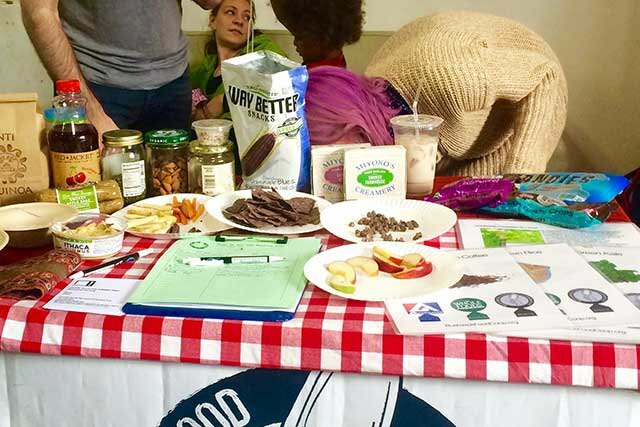 The event, which went from 10 AM - 6 PM, drew huge crowds from all over Brooklyn and showcased local vegan vendors, speakers, and raffles sponsored by vegan favorites such as by Chloe and Blossom Du Jour. The event was conceptually distinct from other vegan-centric events in Bushwick in that the organizers sought to make the event affordable with the intention of presenting a healthy, plant based diet as something anyone can achieve. The organization put its money where its mouth is by donating all of the proceeds raised from donations and raffle tickets to EcoStation NY, a Bushwick-based nonprofit organization that leads sustainable urban farming programs to empower youth and improve access to fresh food in the community. 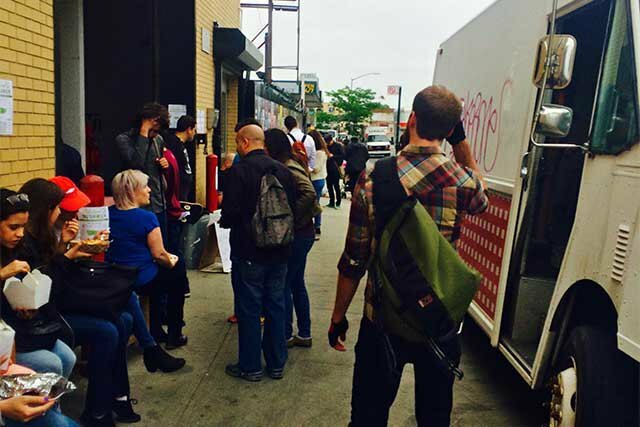 The scene outside Lightspace Studios during Plant Based Bushwick. Amanda Meth for Bushwick Daily. Founder Elizabeth Walsh was inspired to start Plant-Based Bushwick after completing the Self-Expression Leadership Project (SELP) through Landmark Worldwide, a company that offers personal development programs. “I’ve been vegan for a year and it’s been incredibly transformative," Walsh tells Bushwick Daily. "I wanted to make a difference in this community since there are a lot of issues with Type 2 Diabetes and other health problems,” Elizabeth explained. Her hope is to make PBB an annual event; based on Saturday’s turnout, it doesn’t seem like she’ll be having any trouble getting people to show up next year. A bird's eye view of the Plant Based Bushwick crowd on Saturday Afternoon. Amanda Meth for Bushwick Daily. The Bushwick Food Cooperative, which is located around the corner from Lightspace, was among the local organizations that represented at the festival. Coop members at the table walked festival goers through the Coop's membership policies, reminding them that non-members are also free to shop at the Bushwick Food Coop, a decision made to ensure that the coop is accessible to people who may not have time to volunteer every month. The Bushwick Food Coop's spread at Plant Based Bushwick. Amanda Meth for Bushwick Daily. The event had a steady flow of people all day, leaving many of the vendors impressed with the overwhelming response. Among the standout vendors were Marty’s V Burger, whose vegan mac and cheese is just as good as their signature offering. Attendees happily remarked about the turnout at the event. "It’s amazing to see how veganism has blown up,” said Kristen Graham, a native New Yorker who visited the festival with her partner Taylor. Taylor was inspired by the different protein ideas and thought the foods presented at the event reflected the ingenuity of Brooklyn's vegan community. “It’s been awesome to see the enthusiasm that Brooklyn has for veganism,” she said. While tofu has long been thought of as the go-to plant-based protein, more people have been exploring soy-free alternatives and getting creative with new forms of protein. One interesting example: the table for Pure Protein Project, an "initiative to create access to healthy and transparent vegan protein." Their lentil-based meat alternative is called Adashah, which is made with just four ingredients: organic red lentils, organic ground flaxseed, organic ground turmeric root, and water. 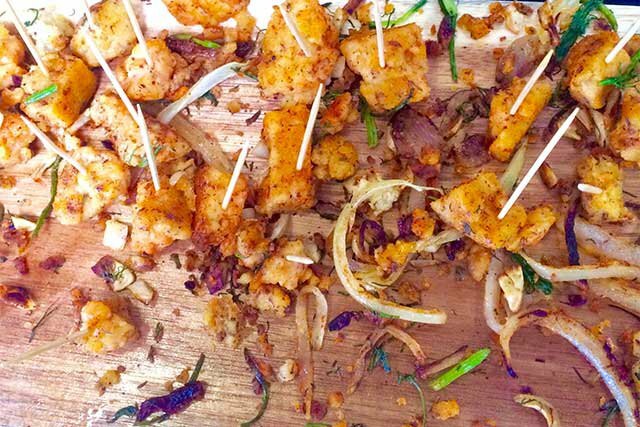 Like tofu, it adapts to the flavors in which it is cooked but is free of soy and gluten. Packages were just $4, and founder Taylor Osin Cohen said all funds raised benefit a local soup kitchen. VOAA (Veg Option Allies & Advocates), a non-profit organization working to “break down barriers between vegans and non-vegans” facilitating fruitful dialogues through delicious meetups and digital communication, was on hand as well. 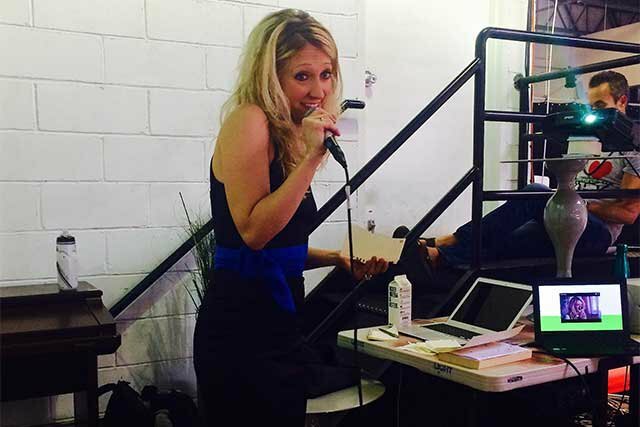 Founder Nicole Moore Eisenberg was one of the featured speakers at Plant-Based Bushwick and provided some useful tips on how to have a more comfortable conversation with friends and family who may be skeptical when it comes to a vegan lifestyle change. Veganism advocate Nicole Moore Eisenberg gives advice to the crowd. Amanda Meth for Bushwick Daily. 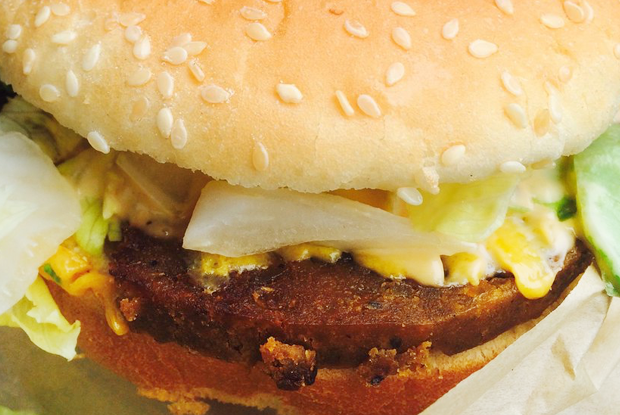 As veganism becomes more mainstream and consumer-based, it can become easy to lose sight of the bigger picture of food justice. At Plant-Based Bushwick, that mission was integrated through the selection of vendors and speakers. The vibe was lively and unpretentious, the food ranged in price and style, and the event was free, staying true to its mission of accessibility. You can check out more info here. 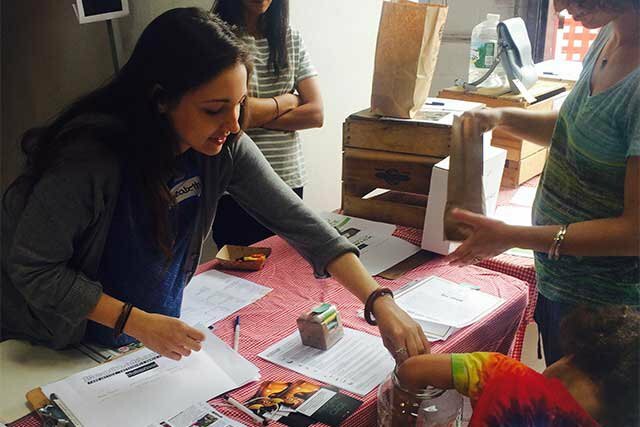 Plant Based Bushwick Founder Elizabeth Walsh and a cool kid draw raffle tickets. Amanda Meth for Bushwick Daily.